Trumpet magician Rick Braun is widely known by his solo projects Intimate Secrets (1993), followed by Night Walk and Christmas Present (1994). His popularity grew with Beat Street (1995), Body And Soul (1996), Full Stride(1998), Kisses In The Rain (2001), Esperanto (2003), Yours Truly (2005), Sessions Vol.1 (2006), RnR (2007) and in 2009 All It Takes. He changed the lead instrument from trumpet and flugelhorn to his voice with Sings With Strings (Artistry Music, 2011). His vocal approach in the spirit of Frank Sinatra, Chet Baker and Nelson Riddle underlayed with a superb orchestration reminds at the swing time. The echo of the audience was mainly positive. That might be the reason that he continues this year with the album Swingin' In The Snow. He introduces into his Christmas album with Irving Berlin's I've Got My Love To Keep Me Warm. This is a Holiday song in full swing with an authentic big band sound arranged by Braun and Philippe Saisse and set in scene by Braun on trumpet, Brandon Fields on saxes and Nick Lane on trombone. Braun's interpretation of It's The Most Wonderful Time Of The Year by Edward Pola and George Wyle stands in the tradition of Andy Williams, Johnny Mathis or Diana Ross. Also the warm sound of Braun's trumpet gets a proper place. A lovely surprise is his performance of the traditional Oh Tannenbaum. After the invitation played on trumpet he sings the first part of the song in German and the second in English language. David Benoit adds his elegant swing on piano. On Frank Loesser's Baby It's Cold Outside Rick Braun is joined by Mindi Abair in a wonderful duet. This version differs from many other interpretations by the perfect execution of the arrangement. Mel Tormé's and Bob Wells' The Christmas Song is one of the most covered songs. Braun is committed as ever to an internalization of the Swingtime. Leroy Anderson's Sleigh Ride finds its vocal equivalent in Braun's harmonic rendition. Peter White and Rick Braun get it right homey. Have Yourself A Merry Little Christmas is a Christmas song introduced by Judy Garland in the 1944 MGM musical Meet Me In St. Louis. Time seems to have stood still since then. Dave Koz, Gregg Karukas and Rick Braun have this treasure preserved for us. Robert Allen and Al Stillman created No Place Like Home For The Holidays. 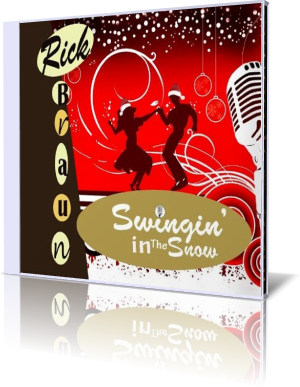 Braun has certainly earned the prize for the best swing version since Perry Como recorded it. Since Bill Crosby's version I'll Be Home For Christmas became a Holiday musical tradition in the United States. Rick presents the song with the most subtle nuance. On White Christmas Braun unites with Manny Ripperson and Steve Kujala to a heart wrenching song in memory of the Drifters. Silent Night is Rick's return to Peter White Christmas, on which the irrepressible voice of Jeffrey Osborne already ringed the bells. With Rick's sensitive trumpet, Kirk Whalum's adorable sax and Jeffrey's divine choir you cannot wish anymore. Who has not found the right music for Christmas, should not hesitate at Braun's album. Take it!